For other uses, see Kaifeng (disambiguation). The name "Kaifeng" first appeared as the area's name after the Qin's conquest of China in the second century BC and literally means "expand the borders" and figuratively "hidden" and "vengeance". Its name was originally Qifeng (simplified Chinese: 啓封; traditional Chinese: 啟封), but the syllable qi (Baxter-Sagart: /*kʰˤijʔ/) was changed to the essentially synonymous kai （/*Nə-[k]ʰˤəj/, /*[k]ʰˤəj/） to avoid the naming taboo of Liu Qi (Emperor Jing of Han). Kaifeng is one of the Eight Ancient Capitals of China. As with Beijing, there have been many reconstructions during its history. In 364 BC during the Warring States period, the State of Wei founded a city called Daliang (大梁) as its capital in this area. During this period, the first of many canals in the area was constructed linking a local river to the Yellow River. When the State of Wei was conquered by the State of Qin, Kaifeng was destroyed and abandoned except for a mid-sized market town, which remained in place. Early in the 7th century, Kaifeng was transformed into a major commercial hub when it was connected to the Grand Canal as well as through the construction of a canal running to western Shandong. In 781 during the Tang dynasty, a new city was reconstructed and named Bian (汴). Bian was the capital of the Later Jin (936–946), Later Han (947–950), and Later Zhou (951–960) of the Five Dynasties and Ten Kingdoms period. 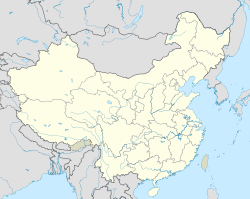 The Song dynasty made Bian its capital when it overthrew the Later Zhou in 960. Shortly afterwards, the city underwent further expansion. During the Song, when it was known as Dongjing or Bianjing, Kaifeng was the capital, with a population of over 400,000 living both inside and outside the city wall. Typhus was an acute problem in the city. The historian Jacques Gernet provides a lively picture of life in this period in his Daily Life in China on the Eve of the Mongol Invasion, 1250-1276, which often draws on Dongjing Meng Hua Lu, a nostalgic memoir of the city of Kaifeng. In 1049, the Youguosi Pagoda (佑國寺塔) – or Iron Pagoda as it is called today – was constructed measuring 54.7 metres (179 ft) in height. It has survived the vicissitudes of war and floods to become the oldest landmark in this ancient city. Another Song-dynasty pagoda, Po Tower [zh], dating from 974, has been partially destroyed. Another well-known sight was the astronomical clock tower of the engineer, scientist, and statesman Su Song (1020–1101 AD). It was crowned with a rotating armillary sphere that was hydraulically-powered (i.e. by water wheel and a water clock), yet it incorporated an escapement mechanism two hundred years before they were found in the clockworks of Europe and featured the first known endless power-transmitting chain drive. Kaifeng reached its peak importance in the 11th century when it was a commercial and industrial center at the intersection of four major canals. During this time, the city was surrounded by three rings of city walls and probably had a population of between 600,000 and 700,000. It is believed that Kaifeng was the largest city in the world from 1013 to 1127. This period ended in 1127 when the city fell to Jurchen invaders during the Jingkang Incident. It subsequently came under the rule of the Jurchen Jin dynasty, which had conquered most of North China during the Jin–Song Wars. While it remained an important administrative center, only the city area inside the inner city wall of the early Song remained settled and the two outer rings were abandoned. 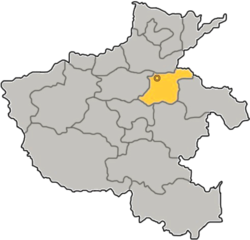 One major problem associated with Kaifeng as the imperial capital of the Song was its location. While it was conveniently situated along the Grand Canal for logistic supply, Kaifeng was militarily vulnerable due to its position on the floodplains of the Yellow River. Kaifeng served as the Jurchen "southern capital" from 1157 (other sources say 1161) and was reconstructed during this time. The Jurchen kept their main capital further north until 1214 when they were forced to move the imperial court southwards to Kaifeng in order to flee from the onslaught of the Mongols. In 1232 they succumbed to the combined Mongol and Song forces in the Mongol siege of Kaifeng. The Mongols captured the city, and in 1279 they conquered all of China. At the beginning of the Ming dynasty in 1368, Kaifeng was made the capital of Henan province. In 1642, Kaifeng was flooded by the Ming army with water from the Yellow River to prevent the peasant rebel Li Zicheng from taking over. After this disaster, the city was abandoned again. In 1662, during the reign of the Kangxi Emperor in the Qing dynasty, Kaifeng was rebuilt. However, further flooding occurred in 1841 followed by another reconstruction in 1843, which produced the contemporary Kaifeng as it stands today. On 6 June 1938, the city was occupied by the invading Japanese Imperial Army. Kaifeng remained the capital of Henan province until 1954, when it was moved to Zhengzhou. In 1969, the former President of the People's Republic of China, Liu Shaoqi, died from medical neglect while under house arrest in Kaifeng. 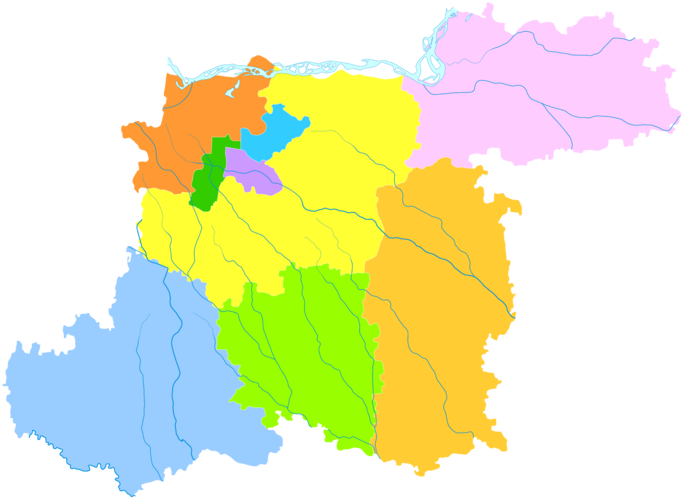 Kaifeng has a monsoon-influenced humid subtropical climate (Köppen Cwa) that borders on a humid continental climate, with four distinct seasons. Winters are cool and mostly dry while summers are hot and humid; spring is warm and sees some, but not much rainfall, while autumn weather is crisp and drier. Precipitation mainly occurs from June to September. Downtown Kaifeng is about 55 km (34 mi) away from Zhengzhou Xinzheng International Airport (IATA: CGO, ICAO: ZHCC), which is the busiest airport in central China in terms of both passenger and cargo traffic (2017 statistics). With the completion of Zhengzhou–Kaifeng intercity railway and Zhengzhou–Xinzheng Airport intercity railway, fast train connections to Zhengzhou Xinzheng International Airport from Kaifeng became available. As of August 2018, there are 12 pairs of intercity trains running between Xinzheng Airport and Songchenglu every day, with a travel time of 53 min. Kaifeng railway station is on the East-West Longhai Railway mainline and provides convenient access to many cities around China, including Beijing West, Shanghai, Shanghai Hongqiao, Tianjin, Xi'an, Jinan, Hangzhou. Services to Zhengzhou, Luoyang and Qingdao are also frequent and convenient. Direct long distance services to Shenzhen, Guangzhou, Chengdu, Chongqing North, Harbin, Ürümqi, Fuzhou, Dalian and Wuhan are also available. The Zhengzhou–Kaifeng intercity railway (郑开城际铁路) started operation on 28 December 2014, connecting the provincial capital Zhengzhou and Kaifeng. The railway currently terminates at Songchenglu, and is planned to be extended to Kaifeng railway station. The designed top speed is 200 km/h (120 mph). Kaifeng North Railway Station of the Xuzhou–Lanzhou high-speed railway is the main high-speed railway station of the city. It started operation on 10 September 2016. There are frequent services to many neighbouring counties, other provincial cities and longer-distance services to other provinces. Kaifeng is known for having the oldest extant Jewish community in China, the Kaifeng Jews. It also has a significant Muslim enclave and is notable for its many women's mosques (nǚsì), including the oldest nǚsì in China: Wangjia Hutong Women's Mosque, which dates to 1820. There are also some active Christian churches, like Sacred-Heart of Kaifang cathedral (开封耶稣圣心主教座堂). Kaifeng cuisine plays a dominant part in forming Henan cuisine. Kaifeng offers a wide range of food specialities such as steaming pie and dumplings. In the evening, Kaifeng's streets turn into restaurants while hundreds open their stands and begin selling their food in the famous night market. Often people from the nearby Zhengzhou come to Kaifeng to spend an evening with their family, as the atmosphere is very appealing. Particularly famous is Kaifeng's five-spice bread (wǔxiāng shāobǐng), which, like pita, can be opened and filled. The Ma Yu Ching's Bucket Chicken House (马豫兴桶子鸡;; Mǎ Yùxīng Tǒngzi Jī), located in Kaifeng, is by some accounts the world's oldest restaurant. The chrysanthemum is the city flower of Kaifeng. The tradition of cultivating different varieties of chrysanthemums stretches all the way back 1600 years, and the scale reached a phenomenal level during the Song dynasty until its loss to the Jürchens in 1126. The city has held the Kaifeng Chrysanthemum Cultural Festival since 1983 (renamed China Kaifeng Chrysanthemum Cultural Festival in 1994). The festival has been a yearly feature since, taking place between 18 October and 18 November every year. The festival reached another milestone in 2012, when it celebrated the 30th birthday. The opening ceremony was broadcast live on Henan Satellite TV Channel (HNTV) at the evening prime slot on 18 October 2012, which has a coverage of all Chinese cities of or above the prefecture-level classification in the Chinese administrative division. During the festival, chrysanthemums of hundred different types will not only be on show in all festival venues, but they become common features all around the city itself - Kaifeng truly becomes the "city of chrysanthemums". The China Zheng-Kai International Marathon (中国郑开国际马拉松赛, Zheng-Kai stands for "Zhengzhou-Kaifeng", also abbreviated "ZK") is a sporting event hosted jointly by the Chinese Athletic Association, the general sport administration of Henan province, Zhengzhou municipal government, and the Kaifeng municipal government. It is the premier international sports competition in Henan province and one of the biggest sports competitions in the Central-West of China. ZK International Marathon is held at the end of March or beginning of April each year. The main part of the event occurs along the famous Zhengkai Express Way (郑开大道). At its launch in 2007, 5600 athletes competed. By 2012, almost 25000 athletes from 28 countries and regions have participated in the ZK International Marathon. Kaifeng is headquarters of the 20th Group Army of the People's Liberation Army, one of the three group armies that comprise the Jinan Military Region responsible for defence of the Yellow River Plain. Kaifeng Air Base is a military airfield in the southern suburb of Kaifeng City. It does not provide civilian aviation service. ^ 中国古今地名大词典 (in Chinese). Shanghai: Shanghai Lexicographical Publishing House. 2005. p. 348. ^ Jacques Gernet. Daily Life in China on the Eve of the Mongol Invasion, 1250-1276. (Stanford, CA: Stanford University Press, 1962). Translated by H. M. Wright. ISBN 0804707200. ^ "Largest Cities Through History". Retrieved November 6, 2010. ^ Lorge, Peter (2005). War, Politics and Society in Early Modern China, 900–1795. Routledge. pp. 52–54. ISBN 978-0-203-96929-8. ^ "The Eastern Manchurian Woodsmen Replacing the Western Manchurian Nomads" (PDF). Retrieved November 6, 2010. ^ 2017年民航机场生产统计公报 (in Chinese). Civil Aviation Administration of China. 2018-03-07. Retrieved 2018-03-15. ^ 豫菜成大器 任重而道远. Retrieved October 28, 2012. ^ "China Kaifeng Chrysanthemum Cultural Festival". Retrieved October 28, 2012. Cotterell, Arthur. (2007). The Imperial Capitals of China: An Inside View of the Celestial Empire. London: Pimlico. pp. 304 pages. ISBN 978-1-84595-009-5. Wikimedia Commons has media related to Kaifeng. Wikivoyage has a travel guide for Kaifeng.